76 Key, Special Edition professional arranger keyboard. TWO new Special Edition SD9 versions. The SD9 “E-SL” (Enhanced + Song Library). This version is installed with our all new, Song Library. Selecting a song name instantly sets up the keyboard with the correct style (and tempo) as well as a selection of sounds assigned to arrangers A, B, C and D (or can be used independently of the arranger). The 250 strong song library is continually growing with free updates to the library during the first 12 months after purchase. In addition, the Ketron SD9 “E-SL” version has expanded internal storage (total 48gb) complete with a huge library of official Ketron Styles as found on previous models such as the X1, SD1 etc. If more storage is required we can install additional 500 gigabytes or 1 terabyte. The SD9 “Monitor Plus” is like no other arranger keyboard you have ever played. 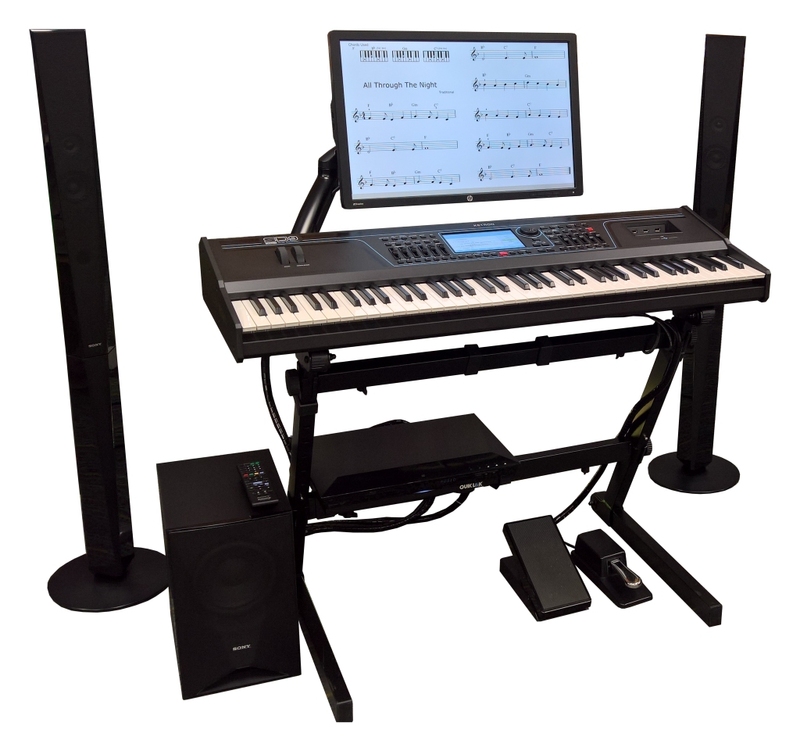 Equipped with all the features of the SD9 “E-SL”, the “Monitor Plus” version incorporates the full set-up; Stand, Bench, Speakers and 21inch Monitor. The Monitor is connected to the stand with a Multi Directional Gas Assisted Arm that can be moved in any direction. Here is the most amazing part: The Monitor will display TWO pages of sheet music side by side, called up simply by selecting a Keyboard registration. 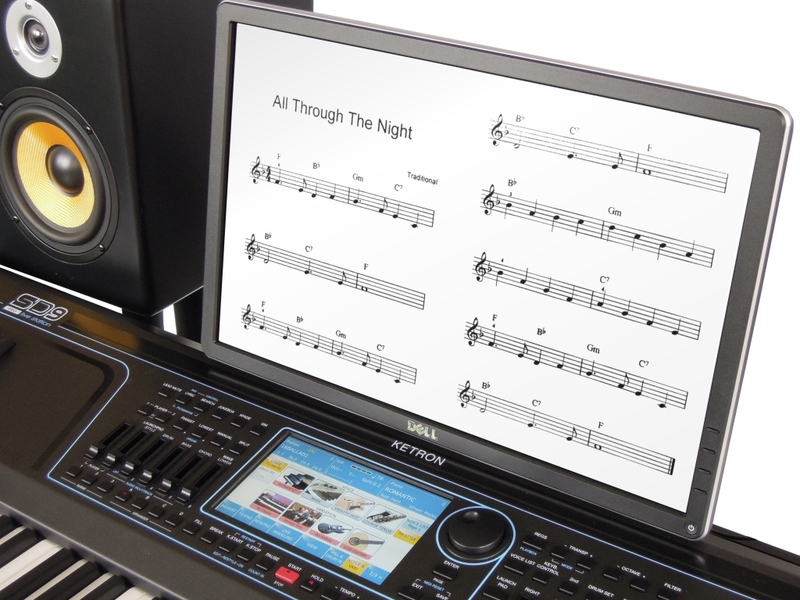 No external tablet or laptop is required as the sheet music is stored on the SD9 itself and each registration has a style with four different voices assigned. The package includes two music books that are embedded into the registrations and easy to follow instructions on how to add your own music with your own digital camera or a scanner (we also offer a scanning service if you are unable to do this yourself; POA). Our new song library, currently 250 song names are linked to the Registrations which instantly sets the keyboard up with styles and sounds suitable for that particular song . As songs are added to the library they will be available free of charge for a period of 12 months (applies to all new and existing SD9 “Monitor Plus” and “E-SL” customers who purchased through Musicworld). For details please call the showroom on 01604 637444.